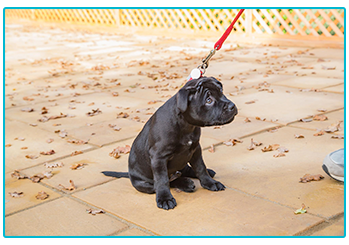 Training a new puppy, or an older dog you’ve adopted, can be testing at times but it might also give you and your pooch a fantastic sense of satisfaction when you develop an understanding. It could be important to remember that not all reluctant dogs are ‘bad dogs’ and some just take a little longer to train, there can often be some underlying reasons for this. At The Insurance Emporium, we want you and your dog to have the best time together, so we’ve put together this guide on the things to look out for when training a reluctant pooch! You might have found that your puppy goes from a bounding bundle of energy to a statuesque immovable object as soon as their lead goes on. This is quite a normal thing to happen and there could be good reason. When wearing a lead, the strange sensation of pressure around their neck can often be enough to stop them in their tracks. You might want to try letting them run around the house with their lead on first to get used to it. Once you’re ready to take them out walking, do it with a happy voice and try to keep the tension out of the lead. 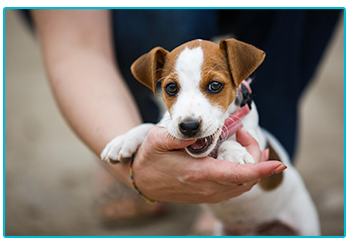 When you’re training your dog, you might find that they have a compulsion to give everything in sight a little nibble! This isn’t an act of aggression but is simply how they play and feel their way around. Usually, this ‘nipping’ is something that they grow out of when feeding from their mother but you might have to train this out yourself. The best thing to do if they get a little rough could be to shout “ouch” loudly, usually they’ll back off then come back and give you a lick. Also, remembering not to play using your hands or feet could be vital. Instead, teach your puppy that they can bite a toy and not you! If your dog has spent a lot of time on their own, away from interaction and socialisation, you might find them acting reluctant or nervous when it comes to visiting new places and meeting new people. If you take small steps to combat this, such as rewards for good behaviour, you could find your dog being desensitised over time. It’s all about being positive and rewarding good behaviour in these situations, as long as you stay in a good mindset, your pooch should too and you can overcome this! Sometimes, when your pup just won’t do what you want, there could be a deeper lying health issue that needs to be resolved. There are a whole variety of different issues that could be causing your pet pooch to act a little bit stubborn. You should head to a vet if you have the slightest inclination that something could be wrong. If there is a health issue, hopefully it can be resolved and your canine will be feeling fine before you know it! Training a reluctant dog might not be the easiest thing in the world but, with a little bit of understanding and a lot of patience, you and your furry friend could be working in harmony in no time! If you’re just starting your adventure with a new pooch, you might want to consider purchasing some Pet Insurance. 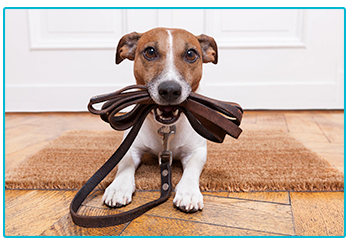 At The Insurance Emporium, our Dog Insurance policies come with a 20% Introductory Discount* and include Vet’s Fees cover up to £8,000^. Head out for walkies to The Insurance Emporium today to find out more! *20% Introductory Discount is only available for the first year of new policies. ^Vet’s Fees cover up to £8,000 available on Lunar Monthly Lifetime Gold policies.